Amongst Logitech’s extensive range of keyboards, there lurks a near-ideal combination of features. Bluetooth, full size keys, a built-in trackpad with scrolling, and all for under £35. The catch? It’s designed for Sony’s Playstation 3. When I requested the Cordless Mediaboard Pro, it was part of an overall request of input devices and was motivated in part by the OtherOS feature of the Playstation 3. I’ve been using that since the PS3 was launched as a handy way of running emulators and old arcade games mostly, though it also allowed some basic VLC and net browsing. Actually, not even that basic, with the right OS it could do quite a lot. That was, of course, at the end of March. Before George Hotz decided to spoil the party for PS3 owners. Regardless, I held off updating for a while; long enough for the Mediaboard to arrive and to test it out – it worked brilliantly with OtherOS, so if you’re looking for a nice wireless keyboard for your PS3 Linux system and are determined to hang on to that feature, this is a great and aesthetically pleasing solution. The styling matches the “phat” PS3 models perfectly, with piano-black finish and a chrome strip for the power and menu/media keys. The only area of the styling I was a bit disappointed by was the design of the Playstation symbols (Circle-Triangle-Square-Cross) – the printing looks thin, and a little heavy in the stroke compared to the key legends and they aren’t coloured. It’s probably a licensing issue, however it cheapens an otherwise excellent design effort. Like the PS3, it shows dust/fingerprints like nothing else as you can probably gather from the gallery. For the rest of us, what does the Mediaboard Pro offer? For PS3 owners, it’s designed and marketed for Playstation Network activity. As PSN is evolved, it will be more relevant not only for messaging/chat applications; it seems inevitable that Facebook and Twitter clients will become part of the XMB given that the Xbox already offers such integration. Naturally via the PS3 browser you have access to a lot of text-based tools as well. However, where the Mediaboard Pro gets interesting is when you naturally realise that it’s just another Bluetooth keyboard. Connected to a Mac, the keyboard is quickly identified (though some key mapping is a bit off) and the same applies to a PC. 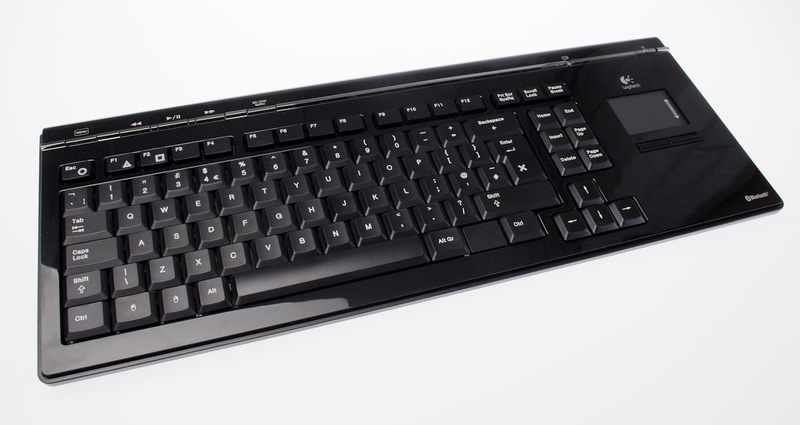 It’s not a perfect solution but as a good, solid and inexpensive wireless keyboard – prices online vary but you can easily pick them up for £35 or less at the moment. As a PS3 peripheral that’s good value as it is, as a means of getting good keyboard spacing for typing on a Mac with the current flat keys, or a bluetooth equipped netbook or PC, it’s an absolute bargain. Battery life is typically claimed to be in years for Logitech keyboards; I am not sure how this will match up with the PS3 model, but with a hardware power switch and the likely usage pattern of PS3 owners I can see it needing a pair of AAs very infrequently. As a keyboard, it’s a little light and clattery with a modern mechanism – it’s a little better than the cheapest PC keyboards but the keys do not feel as heavy as Logitech’s higher end products; it feels surprisingly similar to an early Atari ST keyboard. The spacing is very good and it includes bumps on the home keys for touch-typists. The integrated trackpad is the right balance of “simple”; it supports tap to click, has a scroll area defined, but doesn’t attempt to implement multi-touch or gestures. Two buttons below the trackpad are matched by two mouse-keys on the keyboard where the Windows/Command key would be on a PC or Mac; the only drawback of the keyboard when used on a Mac is the lack of appropriate mapping for Control-Command-Option (there’s no Open-Apple/Command key). It’s not surprising that Logitech only markets this for the PS3 – it undercuts their alternative keyboards by a considerable margin. For £35, I can live with occasionally having to use a menu and enjoying a comfortable keyboard on my netbook whilst also adding a pointing device within easy reach; Logitech would do well to market a “conventional” layout model for netbooks at this price point. Particularly if paired to a tablet system like the JooJoo or possibly the iPad (the trackpad ceases to be relevant on systems designed purely for touch screens however!). It pairs and works – as a keyboard only – with the iPhone under OS 4. If you have a PS3, buy one. If you have a netbook, buy one. If you have a Mac, you may prefer the full-size diNovo Mac edition, which has a numeric keypad – however, as an alternative to the standard Mac keyboard I much prefer the Mediaboard Pro’s layout and key spacing, finding myself using it in parallel with the wired standard keyboard for longer articles.